Old and New Problems in Elementary Particles provides information pertinent to elementary-particle physics. This book examines the types of problems facing high-energy physicists. Comprised of 20 chapters, this book starts with an overview of the fundamental properties of Dirac poles, with emphasis on the spin, the electric-dipole moment, and the mass. This text then examines the applications of supergain antenna, which is an interesting cautionary model against an oversimplified application of the notion of indeterminacy. Other chapters explain the uninhibited adoption of a uniform and natural experimental definition of resonance or particle with respect to hadrons. 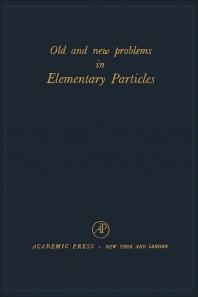 This book illustrates as well how insight into strong-interaction dynamics may be improved by a precise definition of the particle-resonance concept. The final chapter deals with the derivation of the Alder–Weisberger relation, which links the ratio of the two weak coupling constants of the nucleon with an integral over pion absorption cross-sections. Physicists and researchers will find this book useful. 4. Processes of the Type νe + p → e+ + n, etc. 5. Processes of the Type µ → e + γ, etc.